Not too long ago we looked at the Rothwells Building in the city. The building we see today stands next to the Rothwells Building and was constructed at the same time by the same builder. Here is a photograph of the two buildings together, and their similar heritage can readily be noticed. The building on the right, the Rowes Building, was destined to become one of the best-known and busiest in the city. The Rowes Building was constructed in 1885 for Thomas MacDonald-Paterson, a solicitor and member of parliament. It is a five-storey masonry building with a basement. MacDonald-Paterson used the ground floor as his offices and leased those above for offices or warehousing. Further expansion occurred in 1925 when well-known architects Hall and Prentice were engaged to refurbish the building to the tune of £162,000. 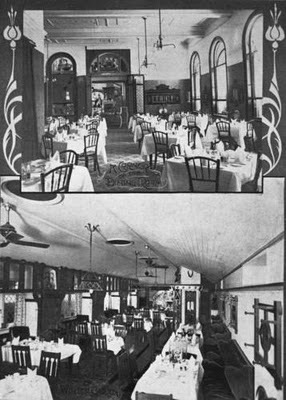 A ballroom was constructed over the basement garage, providing another arm of entertainment for the establishment. In 1958, the building was converted into a shopping arcade and ownership was transferred to National Mutual. This building and its mate, the Rothwells Building, were given a major facelift in 1984, and both buildings are listed on the State Heritage Register. These days it is called Rowes Arcade - it links Edward St to both Queen St and Adelaide St, and it has a huge food court under Post Office Square that is a haven for city workers. Although I don't know the Rowes building from personal shopping experience, I do know how a cafe and diningroom could become an icon of hospitality for the well dressed. Your photos remind me of shopping with my mother in the 50s and being rewarded with afternoon tea on white linen tableclothes. The outside architecture looks remarkably well preserved.